Another day, another jumper dress from Tobi. Whilst on holiday last week, I wore this outfit for a casual trip into Norwich town centre for some shopping. A super casual outfit, but a versatile one too, this time styled with denim although I could think of a couple of different ways to wear this piece. So when I first went to wear this, the idea was to style it with black tights and my leopard print trainers. 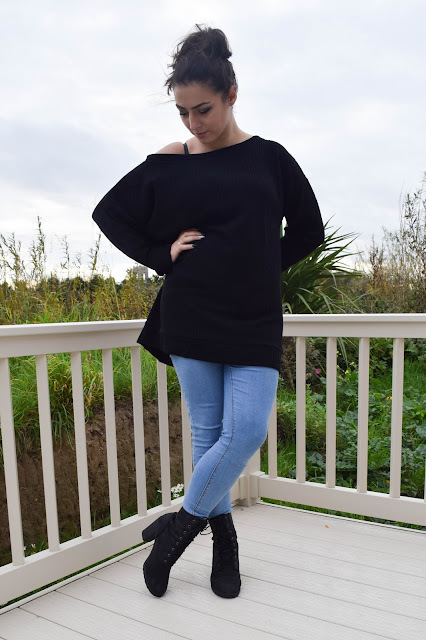 But it was a little windy and cold for that so I opted to style it as an oversized jumper with jeans and my all-time favourite boots. I almost belted it, but John said he liked the oversized, off-the-shoulder look so I left it as it is though it does look good with a waist belt. When I first tried this jumper dress on, I'm not going to lie, I was a little disappointed. I ordered a medium in every dress because the size chart suggested that a medium matched my UK sizing and after checking the measurements, I thought it would be the best fit. Compared to how it looks online, it doesn't look the same on me. The neckline is too big and so looks best as an off-the-shoulder piece and the sleeves are super long. Maybe too long. I also felt like the length wasn't as long as I'd like it to be but that's personal preference. Nevertheless, I think I made it work for me and I like how it looks in this outfit. A little perseverance did this jumper dress well! As I mentioned before, I wore this with jeans and it doesn't look bad at all. I thought about how else I could wear it and I thought about layering it with a gilet, wearing it with my favourite trainers or some fun printed leggings. 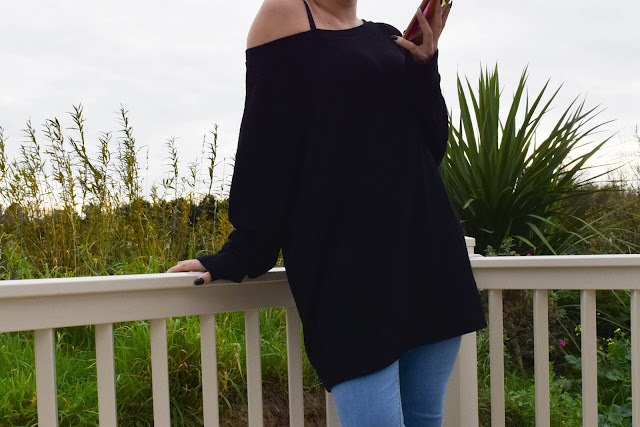 Being a black jumper dress, it's quite versatile and any colour will go with it. It's a thinner material though with a waffle texture so its an interesting piece alone. I definitely want to style this again on the blog so watch this space to see more of this piece. 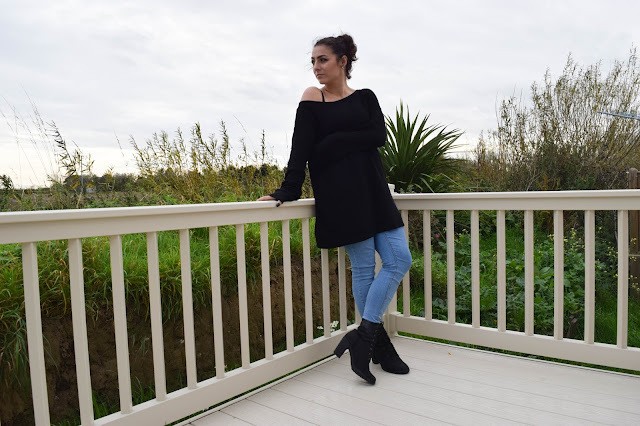 Have you styled any jumper dresses recently? Share your style with me on Twitter or Instagram!